Before installing Workplace ServerWorkplace Server is a component of the Autotask Workplace service. It makes all your files accessible through Workplace while retaining local, centralized data storage so that your data is also available via your local area network (LAN). The Workplace service keeps all data on your LAN accessible internally and in sync with Workplace., please be certain your system meets the Workplace Server Requirements and please carefully review the information referenced in our Before You Begin topic. Please note that in order to take advantage of all Workplace Server features, users must install or upgrade to Workplace DesktopAlso known as the Workplace Desktop app, and in the context of this documentation, simply "the app," Workplace Desktop is the software installed on a computer that is responsible for synchronizing data between the local drive and the cloud. 7.0. Choose the logon account for the Autotask Workplace Server service. If you choose the Account option, enter the domain\user and the password associated with that user account. If you use the default selection (Account (domain\user)) the account must be part of the admin group and listed in the "Log on as a service" policy in the Local Security Policy. The LocalSystem account typically will not have sufficient permissions to the data set to sync; the account selected to run the service under requires full permissions to the data set in order for syncing to function properly! The Windows User account is more likely to have the necessary permissions to the data set, but must be part of the Admin group and listed in the “Log on as a service” policy in the Local Security Policy. Click the Install button. A setup progress window will display. If the popup below appears during the setup process, click the Yes button. Select the Workplace account you want to use in conjunction with Workplace Server, then click the Next button. Enter the password associated with the account you selected, then click the Next button. If you have read and accept the information in the popup, select the I accept the privacy overview and license terms radio button, then click the Next button. When Workplace Server is installed on a device, it automatically creates an “Autotask Workplace Server Violations” folder on the Desktop for the user profile under which it was installed. This folder is used as a storage area for sync violation files. Workplace Server is installed and ready to use. For more information about Workplace Server configuration, please refer to Workplace Server: Settings. Go to the Control Panel > Programs and Features. If you intend to reinstall Workplace Server on the same device and wish to retain the same account information, click the Yes button. 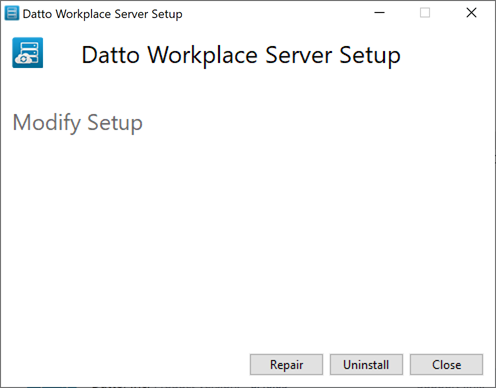 If you do not intend to reinstall Workplace Server on the same device, or if you do wish to reinstall it but do not want to retain the same account information when you reinstall, click the No button.